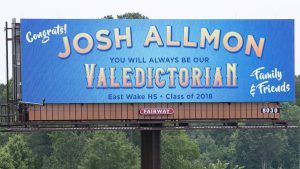 When East Wake High School in Wake County, NC, adopted a policy that no longer names a class valedictorian, a proud father was determined to ensure his son was still recognized for his achievements. 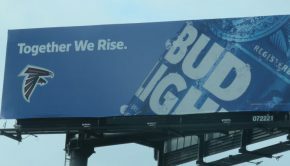 Gary Allmon purchased a digital billboard ad. 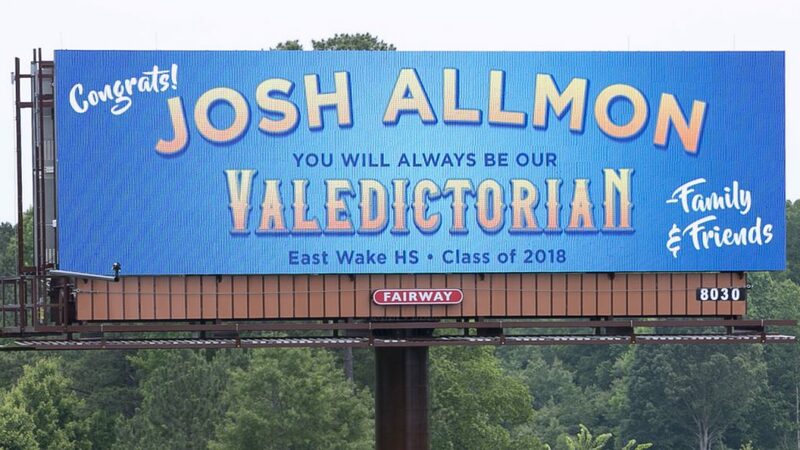 “East Wake High School and Wake County Public School Board may not recognize Josh’s hard work but we will,’’ Gary Allmon wrote on Facebook. Allmon’s actions on behalf of his son earned national media attention, including the TODAY Show. Families use billboards to shine a spotlight on great achievements and milestones in life, not only recognizing the individual, but also encouraging the community to honor and recognize their successes. In Harker Heights, TX, Tracy Goodwin was shocked to find his father used a billboard to congratulate him for graduating high school. Goodwin shared a photo of the billboard his dad arranged to Twitter, writing, “My dad put me on a billboard for my graduation. It’s lit! !” The billboard read, “Congratulations on your 2018 high school graduation, love dad,” and had a photo of Goodwin in his graduation cap and robe. FOX 29 in Houston covered the story. When Houston Smith graduated with honors from Dillard University in New Orleans, LA, his parents wanted to “do something special” to honor their son, so they purchased a billboard ad. Smith “had no clue his parents were planning to give him such an elaborate gift,” according to The Times-Picayune. The billboard also advises future employers to contact 2PoorParents@gmail.com with job prospects. IKYMI: A @du1869 student’s parents got him a billboard made as a graduation gift! 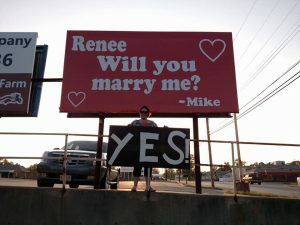 In Beatrice, NE, Mike Splitter had planned to ask his girlfriend to marry him under a billboard with a special message for her. 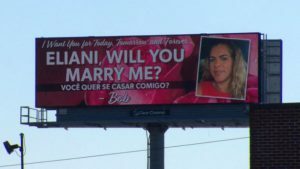 However, the billboard was posted a day early, according to the Beatrice Daily Sun, and members of the neighborhood watch Facebook page immediately began to post suspicions about for whom the proposal might be intended. Word traveled fast, and Splitter’s now-wife received text messages with pictures of the billboard before she saw it in person. Splitter proposed that evening, and they went for pictures by the billboard, where she said “yes” again. When a South Carolina couple welcome the first baby girl born into the family in 137 years, friends and colleagues thought it only fitting to announce the good news to the community with a billboard. See the ABC News story. The family of Dorothy Meng, known as “Nana,” surprised her with a 90th birthday billboard in Des Moines, IA. The billboard had a picture of Meng and read, “Happy 90th Dorothy!” It is also tagged #nanafanclub. Meng’s family captured her surprise on video. Watch here on NBC 13. A Tallahassee family honors the life of Kris McElhenny with safety messages on billboards. 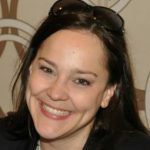 McElhenny was killed in a motorcycle crash in 2002. His family puts up a billboard each year to boost awareness. “I’m a proud mom. I’m excited to see his face up there. He’s getting a very important message out there. You know he’s help saving lives,” his mother, Tina McElhenny, told WCTV.